I stand at the shore overlooking an ocean of possibilities. It has been just under a year since I started studying Brazilian Jiu Jitsu and I can say that I am finally scraping the surface of what this is all about. Of course seeing is different than doing and that is different than saying, but for myself, the picture that I am drawing is undeniable. I am starting to understand. After 6 years of Karate around the time I received my invitation to grade for Shodan, that was the time I started to "get it". And things were clearer after the year and a half of intense preparation to achieve my Black Belt. 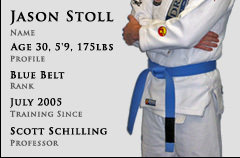 It has been years since I earned that belt and I buried those teachings. Brazilian Jiu Jitsu is un-earthing the core of those learnings. The only problem with an ocean of possibilities is you first need a boat. And that boat needs to be constantly worked on and improved in order to float in a sometimes calm or a sometimes choppy ocean. The better you take care of that boat, the better it will work for you. The challenge after the boat is in good working order is how to steer it. You can go forward, left, right, circle around, stop, and reverse. A captain can adapt to the conditions of the ocean and with more time spent on the water, can anticipate conditions and go with the flow. If the captain makes a mistake, the boat could get damaged and sink. And that happens. But the boat can be rebuilt and the captain should know better for the next time. Now that the boat is in good working order and the captain has some skill in controlling the boat it is time for the navigator or pilot to take charge. Because the ocean is so large, the pilot has the tough duty of leading the captain in the right direction. The direction depends on the destination. The tough part is figuring out the destination. And that is the place where I am at. My boat (body) is in pretty good condition. My captain (techniques and rolling skills) are improving in every class. My navigator (game plan) has not yet been developed to a place where it is functional. At a white belt level, where I am happy to be, I must go with the flow. And that is a lot of fun when training because I do not know what to expect. But I understand that the next level is putting together a plan of action in every roll for every position in order to move myself forward. I mentioned this in an earlier post, but when I actually started to do this, I found out exactly how much I know about Brazilian Jiu Jitsu. My three options from each position. What do I try first or based on my opponent's position. If that fails, what next. If that works, what next. Knowing what I need to have myself in the proper position for what I want to do. The plan falls apart, how can I adapt to get back to a place I need to be to work my plan. Once the plan is established, it must be practiced until second nature. It is a matter of applying the plan faster and faster with more accuracy. It all starts with writing it down from memory. If you can do that without looking at notes, you know it sits in your mind as a functional extention of what is possible or that you can actually do. Then memorize the plan and work on every element until it you have it consistently. All plans can be modified and improved as needed. But everyone must start somewhere. As I said in the beginning; seeing is different than doing and that is different than saying. I may not have mastered all the techniques I have learned over the past year. But I know what I like and I think I can tie them all together to really build my base; my next step in Brazilian Jiu Jitsu.